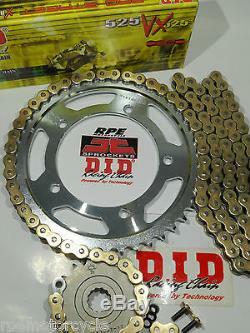 Complete Performance Chain & Sprocket Kit. Premium "Made in Japan" D. Included in this kit: OEM 525 gearing sizes options.. 525 exact OEM 15/40t -or- 525 Quick Acceleration 15/43t. Unless otherwise specified, 525 exact OEM Ratio 15/40t will be sent as follows. 15 tooth Front & 40 tooth Rear Sprocket. (c49 high carbon steel rear, scm420 chromoly Japan steel alloy front). 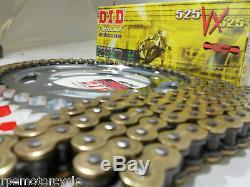 The new Pro Street VX 525 x 108 Gold X -Ring drive chain. (Exact fit OEM sizes and gear ratio, or specify Custom sizes). Also available in optional gear ratios. Call RPE to special order. 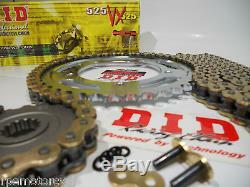 Chain & sprockets are sent OEM size with Gold DID chain with a RIVET type master link. Please specify in "ADD MESSAGE" tab at checkout if optional gearing is desired. For QUICK ACCELERATION gear ratio (Quicker off the line, roll on's, wheelies). Request a 43t (+3t) rear sprocket during check out in the "Add Message" tab. This quick ratio will be much quicker, but slower top speed with higher freeway cruising rpm's. A 1 tooth change in the front is equivalent to a 3 tooth change in the rear.. EXAMPLE: (-1 tooth front = +3 teeth rear) or (+1 tooth front = -3 teeth rear). Is the same as +4 rear only without changing the front. Stock OEM RATIO gearing 15/40t is the factory calculated "happy medium" of both low end acceleration and top end speed. Exact OEM Ratio is the DEFAULT that will be sent unless otherwise specified/. Optional 525 Sprocket Sizes Available. Sprocket also available in 525 x 15 teeth only. Sprocket also available in 525 x 39, 40, 41, 42, and 43 teeth (525 JT rear sprockets are silver). Will rivet hollow nose master links (will not rivet solid soft-nose pins). Will push pin completely through link/side plate. Hardened body, riveting tip and breaker pin for strength and durability. Removable handle for compact storage. Perfect for trail/road tool pack if you have a chain with a rivet master link. Hours: M-F 9-6, Sat 9-5 Pacific Std. JT Sprockets and DID Chain, the leading edge technology in production and materials with total dedication to excellence gives you the ultimate motorcycle sprocket and chain range at unbeatable value. Our mission is to supply you the most innovative and competitive product line fully backed by complete availability and service. Your Absolute Satisfaction is our Commitment with JT Sprockets and DID Chain - World's No. 1 manufacturers of aftermarket motorcycle chain and sprockets, constantly raising the industry's standards in performance, longevity and reliability. The item "ZX-6R Ninja 1998-2002 525 DID Chain and Sprockets Kit Premium 525 conversion" is in sale since Monday, June 26, 2017.